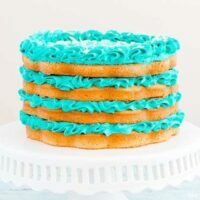 Your favorite vanilla cake layered with fresh blueberry compote and topped with buttercream make this Blueberries and Cream Layer Cake the perfect cake for any occasion! My friends who work at the USO Warrior & Family Center at Fort Belvoir asked if I would make a baby shower cake for one of the women I absolutely had to say yes! Casey gave me free range to make whatever I wanted for Ranna’s cake since she had seen what I had created for them in the past. I was super excited to make something really special for them! I decided to go with my favorite box cake mix for vanilla cake. Don’t hate me, but I do not have an amazing vanilla cake recipe yet that works out perfectly every time I bake it. So, that means that I go with a super moist box mix. However, I find that when I pair a box cake mix with a delicious homemade fruit compote and freshly whipped buttercream… no one can tell it’s from a box! The inside is filled with a deliciously sweet and slightly tart homemade chunky blueberry compote. I chose the blueberry because Ranna is having a sweet baby boy and I wanted the entire cake to be on theme! 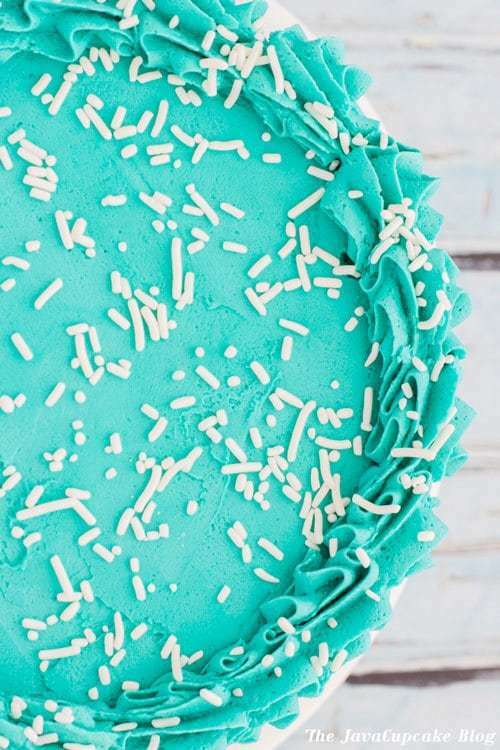 I used my favorite whipped buttercream tinted in a beautiful shade of blue and topped it all with a sprinkling of white jimmies! 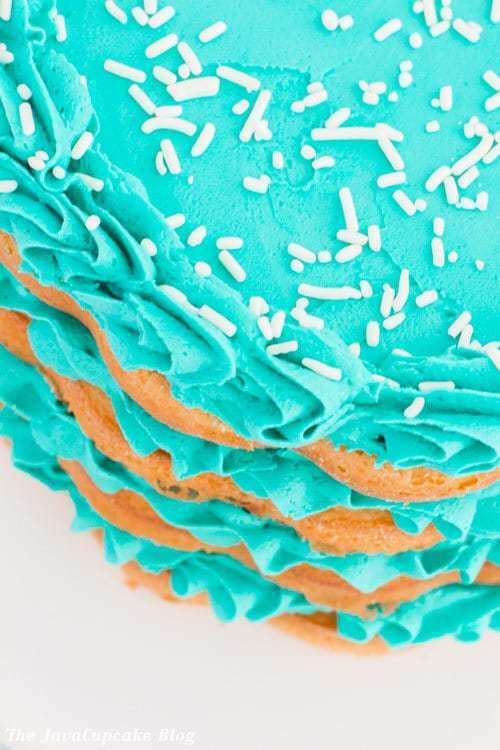 Did you notice those adorable fluted edges on the cake? I used a fun scalloped edge cake pan I found at Home Goods. Check out the video below for a description of the pan and to see step by step how I filled and frosted the cake! Follow the directions on the box of cake mix to prepare batter. Grease and flour the cake pan. Divide the batter evenly by weight into 4 parts. Bake each part at the temperature listed on the box for 7-15 minutes or until a toothpick comes out clean from the center. In a large pan, combine the butter, sugar, lemon zest, juice and berries over medium high heat. Once the sugar and butter have melted, begin mashing the blueberries until about half of them are in pieces. You want this to be chunky so don't over mash the berries. Cook for 5-10 minutes over medium heat. The mixture should be gently bubbling but not boiling. Stir frequently. Sprinkle the corn starch over the mixture and mix until completely incorporated and no chunks remain. Cook for an additional 2-3 minutes. Remove from the heat and allow to cool completely. The mixture will solidify and shouldn't be runny when cool. Mix the butter, sugar, vanilla and 1/4 cup of cream together until smooth. Add up to 1/4 cup more cream to reach your desired consistency. Mix in the fool coloring until you have the color you want. Beat the frosting on high for 3-5 minutes or until light and fluffy. Place first layer of cake onto a cake place/stand. Fill a piping bag fitted with a Wilton 1M piping tip with frosting and pipe a layer of frosting onto the outside edge of the top of the cake. 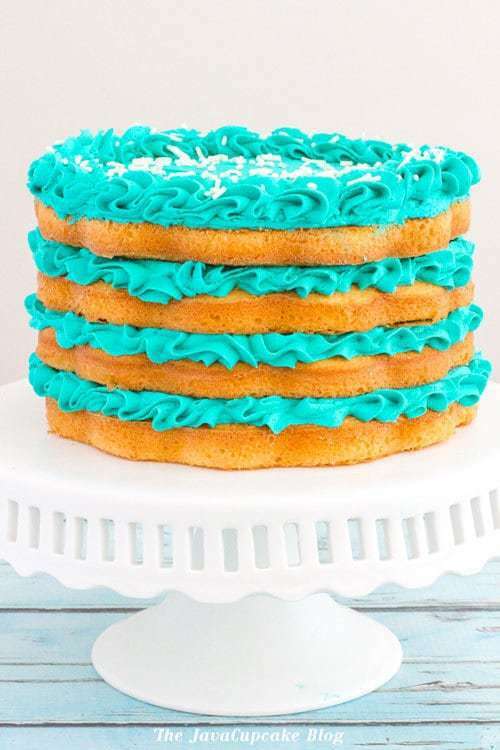 Fill the inside of cake with a layer of blueberry filling. Place another layer of cake on top, making sure to line up the scallops line up. 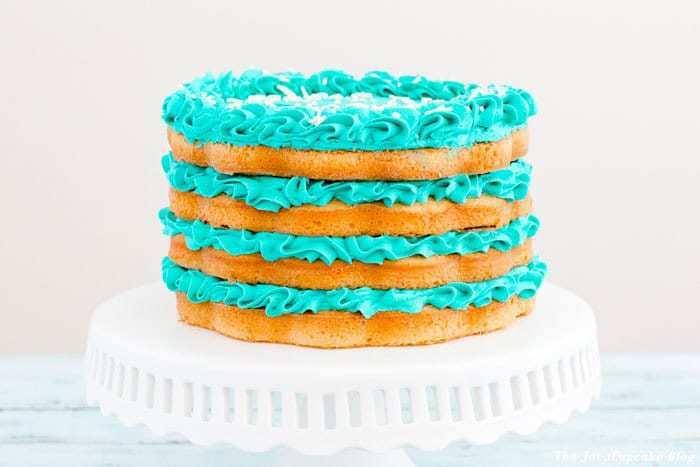 When you get to the top layer, spread a thin layer of frosting on top just to the edge. Don't worry about getting it all the way to the edges because you're going to cover with the piping bag frosting. Make sure the frosting is smooth and flat. Pipe a pretty scalloped edge of frosting onto the outside top of the cake. Sprinkle white jimmes over the top of the frosting. Cut and slice and enjoy! Make sure to watch the video above to see how I filled and frosted this cake! Woiuld love to see when you cut into it, what it looks like. May need to try although perhaps above my skill level! YUM!! The cake looks fantastic and the video is very informative! Thank you! Gorgeous! Super easy to make, too!